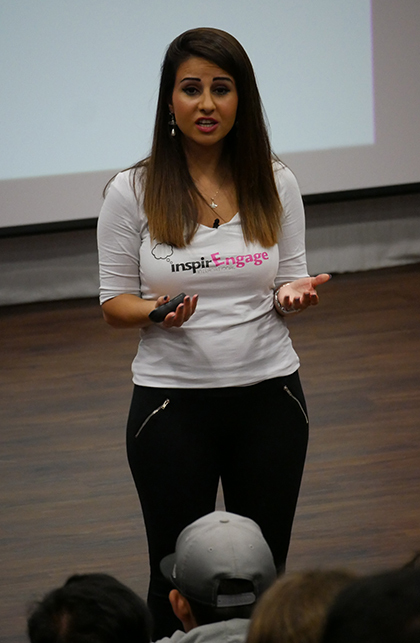 Former contestant from The Apprentice, Melody Hossiani visited The Sixth Form College, Solihull this week to deliver a motivational talk to BTEC students. Melody Hossiani is founder and Chief Executive of InspirEngage and she visited the College as part of her Success Tour, motivating young people to be successful. She spoke about growing up in Iran and moving first to Sweden and then to the UK to flee the ongoing war in her country when she was 3 years old. Among the messages she had for our students, which were all about how to be successful, she told the students that success was “a choice, a choice to say yes to opportunity”. Her advice to students was to say “yes” to things, put the hours in to get rewards and to create opportunities for themselves. The event was part of the launch of the College’s Career Passport programme to new BTEC students on our Applied Science, Art & Design, Business, Childcare, Health & Social Care, IT and Sport courses. The Career Passport is a scheme unique to the College that helps students to develop employability skills through work experience, internships and volunteering. Students will be asked to complete a skills self-assessment and then work on developing those skills they feel need work to ensure they are highly employable by the time they leave College. They will be supported to building up their hours of work or volunteering (known as Professional Development Activities), with the aim to achieve enough hours to be awarded a Career Passport. Those students who complete 35 hours will get a Bronze Award, those doing 70 hours will get a Silver Award and those completing 100 hours will achieve a Gold Award. As well as Melody Hossaini, representatives from the National Citizen Service (NCS) were also at College to talk to students about opportunities available to them.